LAS VEGAS—Allow me to preface this by saying this is my opinion and not that of TechHive or PCWorld as whole, since I was the only editor there and Tuesday was the first day of the show. With that out of the way, it will be hard to top the product demo that Meridian Audio put on for me yesterday. Meridian has an impressive track record for developing high-resolution audio-encoding technology. It developed one of the two mandatory codecs used in Blu-ray discs (they licensed the technology that became Dolby Pro HD), and they developed the codec used in SACD (Super Audio Compact Disc). To my ears, its MQA technology is even more impressive—and not just because of the sound quality. MP3s became a thing because early broadband was extremely slow and MP3s could pack a lot of music into little tiny files that were easily shared. When online streaming services came along, they also adopted the MP3 format. It doesn’t consume a lot of bandwidth, and people were already accustomed to the audio quality. The smaller the stream, the less bandwidth the service provider has to pay out. Back on the consumer front, convenience trumped quality for a lot of people, and they soon forgot there was anything more. Yes, you could say I was verklempt. Today’s broadband is fast (although not as fast in the U.S. as it should be, but that’s another story). And some premium music-streaming services—such as Tidal—are streaming CD-quality music over the Internet. But the file sizes for true high-resolution music (24-bit, 96kHz and higher) are just too big to stream at a reasonable cost. This is where Merdian’s MQA comes in. 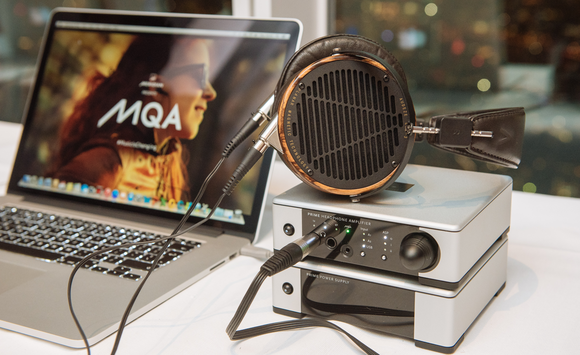 With MQA, the record label can go back to the recording artist’s original studio-master recording and losslessly encode it to a file that’s no larger than that of a compact disc. So what you hear on your home stereo or on your digital media player is of the exact same quality as what the artist heard in the studio when he or she created it. This is a good time to let you know that MQA is an acronym for Master Quality Authenticated. I’ve already explained the “master quality” bit; “authenticated” comes from a sort of digital fingerprint that’s embedded in the file. When you play the file back on an MQA-certified digital-to-analog converter, an LED will glow to provide confirmation that the artist, the recording engineer, or the producer have verified that what you’re listening to was sourced from the studio-master recording. And that leads up to my next point: You’ll obviously need an MQA decoder to hear the studio-master recordings, but that decoder can exist in either hardware or in software (provided there’s a processor with enough horsepower to run it). MQA, however, is also backward compatible. Play the file on something that doesn’t have an MQA decoder, and you’ll get at least CD-quality audio. During my demo, Meridian spokesperson Spencer Chrislu cheekily suggested that he thought it might actually be a little better than CD quality. Chrislu demoed the system for me at the Venetian, where all the high-end audio vendors hawk their wares in large, well-isolated suites. I sat on a couch in front of a pair of very high-end speakers and asked to hear tracks from two of my favorite recording artists: Dire Straits and Steely Dan. I expected to hear more detail and better separation in the guitar, drums (especially the cymbals and high hat), and I did. I heard guitar parts in “Sultans of Swing” that I never knew existed. And the decay in some of the bass lines in “Gaucho” shocked me; I’d never known those notes lasted as long as they did. But what really knocked me out was the quality of the vocals. I don’t know a better way to explain it than to say it was like hearing human beings sing after listening to robots. There was such an emotional aspect to it than when Chrislu asked me what I thought at the end of the demo, I actually got choked up and couldn’t answer him for a moment. Yes, you could say I was verklemp. Okay, I saved the best part for last. DACs with MQA decoders shouldn’t cost and a leg. Chrislu showed me Meridian’s own Explorer2 USB DAC that will sell for $300. And I have an appointment with Pure (a division of Imagination Technology) to hear a demo of its Caskeid multi-room audio technology. Caskeid is the first multi-channel audio system to support MQA. Meridian Audio chairman and co-founder Bob Stuart says Caskeid “is the only wireless multiroom synchronization technology out there that truly offers a platform for high-quality audio.” Pure sells some speakers with Caskeid technology, but the company also licenses Caskeid to other manufacturers. I wouldn’t expect components that cost a few hundred bucks to deliver the same performance as systems that cost tens of thousands of dollars, but the point of diminishing returns sets in rapidly with audio gear. You can get some very high-quality products these days without spending a ton of money. I’m very much looking forward to hearing what Pure has to offer. And Chrislu said he would send TechHive a Meridian Explorer2 USB DAC for review as well. Stay tuned.